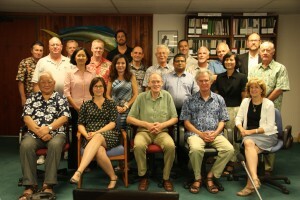 HONOLULU (WPRFMC) – 23 September 2014 – The Western Pacific Regional Fishery Management Council sponsored a first of its kind workshop on Sept. 18–20, 2014, at the Council office in Honolulu to discuss the concept of “disproportionate burden.” The subject of disproportionate burden is particularly relevant at this time because the Western and Central Pacific Fisheries Commission (WCPFC) is considering international bigeye tuna management measures that may result in burdens to small Pacific islands. The WCPFC is an international body that manages tuna fisheries in the Western and Central Pacific Ocean. Under the UN Convention on the Law of the Sea, various international agreements have been created for the purpose of conserving and managing migratory fish stocks that move across international boundaries. Many of these agreements require participants to ensure that conservation actions do not transfer a disproportionate burden onto small island developing states (SIDS), including the territories and possessions of various nations. The WCPFC contains both SIDS such as Tuvalu, Cook Islands, Kiribati and the US territories of Guam, American Samoa and the Commonwealth of the Northern Mariana Islands as well as metropolitan countries such as the United States, Japan, China and the European Union. Workshop participants discussed ways to define and measure disproportionate burden and ways to ensure a fair distribution of conservation costs to the satisfaction of WCPFC members. Also discussed was who pays compensation when a disproportionate burden is incurred. Participants suggested, depending on the situation, it might be those who benefit most from a management measure, those most responsible for depleting the resource or those most able to pay. Economists, scientists and fisheries managers from the Pacific Region, Indian Ocean, United States and Europe participated in the workshop. The outputs of the workshop will be discussed at a meeting of the Permanent Advisory Committee to advise the US Commissioners to the WCPFC in Honolulu on Oct. 6–7, 2014, as well as the WCPFC workshop on disproportionate burden in Apia, Samoa, on Nov. 27, 2014. The eleventh regular session of the WCPFC will be held on Dec. 1–5, 2014, in Apia. In 2013, the tenth regular session of the WCPFC adopted a conservation and management measure (CMM 2013-06) specifically to address disproportionate burden. Among other things, the CMM 2013-06 requires that the Commission shall ensure that any CMMs do not result in transferring, directly or indirectly, a disproportionate burden of conservation action onto SIDS, territories or possessions. The cost of implementing a CMM would differ across the economic spectrum of the Commission members. The Western Pacific Fishery Management Council was established by Congress to manage fisheries in offshore waters around Hawaii, American Samoa, Guam, Commonwealth of the Northern Mariana Islands and the US Pacific remote island areas. For more information, visit www.wpcouncil.org, email info.wpcouncil@noaa.gov, phone (808) 522-8220 or fax (808) 522-8226.